(1) WW 1984. Director Patty Jenkins and Gal Gadot tweeted today about Wonder Woman 2 — now called Wonder Woman 1984. Jenkins’ tweet shows that Chris Pine is in the movie even though his character, Steve Trevor, was killed at the end of Wonder Woman. (2) YOON HA LEE ON TOUR. The 1000 Year Plan is today’s stop on the “Revenant Gun Blog Tour – A Q&A with Yoon Ha Lee”. In nearly two decades of publishing short fiction, you’ve built so many different universes and mythologies where we are only offered a glimpse of what seems like a much richer context. Most of these stories are one-offs; what was it about the Hexarchate concept that compelled you grow it into a larger epic? Have you entertained the idea of expanding on any of your other stories? I’d been wanting to write a novel for a while, but my first substantive attempt, which I (affectionately?) call the Millstone Fantasy Novel, was ten years in the making and turned out to be fatally flawed, so I trunked it. I love space opera, though, everything from Simon R. Green’s Deathstalker books to Lois McMaster Bujold’s Vorkosigan Saga to Jack Campbell’s Black Jack Geary books, and I wanted to try my hand at it. Even then, Ninefox Gambit was originally going to be a one-off. When I came to the end, however, I realized that I had more to say about the setting and more ideas for plot. I suppose part of it’s laziness as well–having generated all those setting details, it seemed a shame not to get some more use out of them! I’ve occasionally thought about revisiting a few of my past stories, but most of them feel complete in themselves. Especially at shorter lengths, I’m really more focused on the idea than building an elaborate world that can be explored again and again. I’m probably more likely to do something new and different to keep myself entertained. [Camestros] It is more of an attitude than a strictly prescribed lifestyle. [Timothy] It cleary says “OR”! [Camestros] Let’s change the subject shall we? I’m already on the sixth line of dialogue, I’m not going back and changing the list of characters now. (4) QUESTION AUTHORITY. Rachel Swirsky speaks up: “In Defense of ‘Slice of Life’ Stories”. Many poems attempt to communicate an impression or an emotion. A poem about nature might not be intended to communicate “here is an intellectual idea about nature,” but instead “this is what it looked like through my eyes” and “this is how it felt.” Fine art landscapes can be like that, too. They depict a place at a time, both transient, through the eye of the painter (where the eye of the painter may figure more or less into the image, depending on whether it’s a realistic painting, etc). What this makes me wonder is–why are we so dismissive of this in fiction? Plots are excellent; ideas are excellent. But what’s so wrong with a slice of life, that we refer to it with distaste? Why can’t fiction be about rendering transient, momentary emotions? Why do we demand they always be in the context of a plot? (5) A GOOD EXAMPLE. Tor.com’s Leah Schnelbach tells “How Ann Leckie’s Ancillary Justice Avoids the Dreaded Infodump”. …In the interest of slaying this monster, I’m going to walk you through the opening pages of Ann Leckie’s Hugo Award-winning Ancillary Justice—which gives the reader the perfect amount of info, without becoming too dumpy. Think of this like going on a date, or grabbing coffee with a new friend—you give a few details, sure, but you don’t narrate a bullet list of your whole life. When you’re writing, you’re on a date with your reader. Ideally, your story will charm them enough that they lose track of time and hang out with you until you both suddenly realize that the restaurant has closed, all the other diners have left, and an annoyed busboy has to unlock the front door to let you out. To get a feel for how to include lots of worldbuilding without killing your story’s momentum, let’s look at an example of a great opening. The first four pages of Ancillary Justice introduce us to a mysterious narrator, a harsh world, and two different conflicts right away, all while seeding in enough questions about the book’s world to keep us turning pages. You can read the first chapter over on NPR; below, I’ll pull the text apart (roughly half of NPR’s excerpt) paragraph by paragraph and unpack how and why it works. (6) STAN LEE NEWS. The Hollywood Reporter says “Stan Lee Granted Restraining Order Against Business Manager, LAPD Investigating Claims of Elder Abuse”. The move comes two days after Keya Morgan was arrested on suspicion of filing a false report to police. Stan Lee on Wednesday filed for a restraining order against the man he said last week was the only person who was handling his affairs and business, Keya Morgan, a Los Angeles Superior Court media relations rep confirmed to The Hollywood Reporter. Lee was granted a temporary restraining order against Morgan, authorities told THR. The request for a permanent order is 43 pages long. A court date to decide that request is set for July 6. The restraining order request was filed two days after Morgan was arrested on suspicion of filing a false report to police. Morgan was released from jail on $20,000 bail. The LAPD is investigating reports of elder abuse against Lee. The investigation began in February, but only became public knowledge Wednesday. (7) WELDON ON INCREDIBLES 2. NPR’s Glen Weldon says: “Retrofuturistic ‘The Incredibles 2’ Is More Retro Than Futuristic”. Brad Bird’s virtuosic 2004 animated movie The Incredibles is the best superhero film that has ever been made and is likely the best superhero film that ever will be made. This is a fact — a cold, hard one. The massive, resolute, essential truth of this fact is abiding and irresistible and immovable; it possesses its own magnetic field, its own solar day…. The villain — a mysterious masked figure known as the Screenslaver, who uses television to control the minds of hapless citizens (and heroes) — arrives with a villainous manifesto, albeit a slightly muddier one than that of the first film’s nemesis. And that same conceptual muddiness, a byproduct of the sequel’s need to expand on and complicate the world of the first film, seeps slowly into the entire film. (8) KNOCK IT OFF. Another response to abusive Star Wars fans — “John Boyega tells Star Wars fans to stop harassing cast”. Star Wars actor John Boyega has urged fans of the franchise to stop harassing the cast on social media. His comments came after two co-stars, Daisy Ridley and Kelly Marie Tran, quit Instagram after receiving online abuse. To the majority of Star Wars fans thank you for supporting and putting yourselves in our shoes. You understand that there is a process so much appreciated ! June 13, 1953 — The Beast From 20,000 Fathoms was released theatrically. Born June 13 – Malcolm McDowell, 75. Alex in A Clockwork Orange of course but King Arthur in Arthur the King, Dr. Miles Langford in Class of 1999, Soran in Star Trek: Generations, Arcady Duvall in the Jonah Hex episode of Batman: The Animated Series, Mr. Roarke, The Host, in the second Fantasy Island series, and far, far took many other roles to note here. Born June 13 – Tim Allen, 65. Galaxy Quest’s Jason Nesmith and Toy Story’s Buzz Lightyear. Born June 13 – Ally Sheedy, 56. In X-Men: Apocalypse Scott’s Teacher as Scott’s Teacher. Born June 13 – Chris Evans, 37. Various Marvel films including of course The Avengers and Thor. John King Tarpinian found some laughs on the beach at Moderately Confused. To put it another way: Are colorful, cartoonish Racing Presidents and Willy Wonka scratchers the alcopops and fruit-flavored vape pens of the lottery world? I contacted the two lottery agencies and they said no. Oh, good, okay then. .?.?. But, you know, let’s explore this a little more. 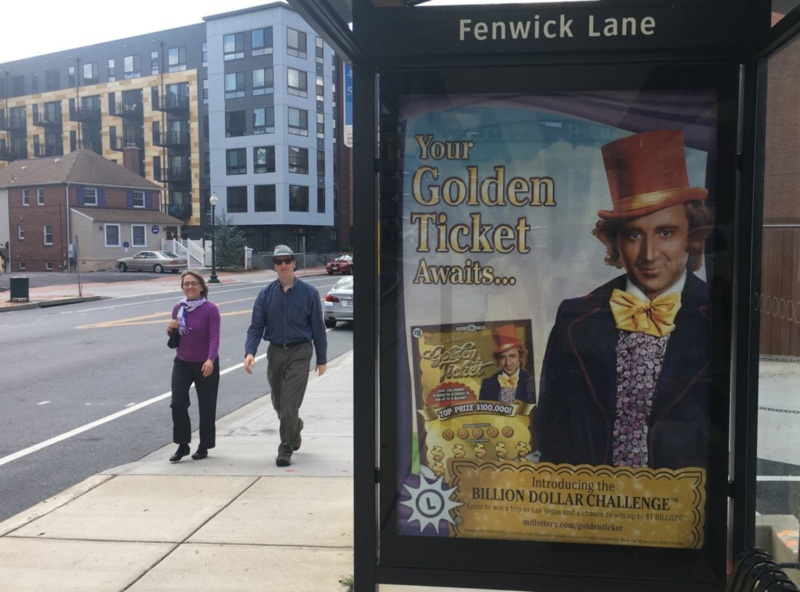 Gordon Medenica, director of the Maryland Lottery and Gaming Control Agency, said he was actually a little reticent when first approached by the company that created the Willy Wonka scratch-off, Scientific Games of Las Vegas. What changed Medenica’s mind were assurances from Scientific Games that Willy Wonka was no longer a children’s character. Many casinos, they reminded him, have Willy Wonka-branded slot machines. “The adults who play the games have a fond memory of that movie, but in fact it has almost zero resonance with children today, oddly enough,” Medenica said. (13) MOAT NOT INCLUDED. One of Mike Kennedy’s local news feeds (WAFF TV) alerted him to the availability of some prime unreal estate: “You can own this castle in Georgia for less than $1 million”. This 57,000 sq.ft. castle is in Menio GA — that’s near the state line with Alabama but not terribly near any sizable city. By road, it’s about 100 miles NW of Atlanta, about 50 miles SSW of Chattanooga TN, and a little over 100 miles NE of Birmingham AL. From my home (Huntsville AL), I’d have to travel over 80 miles EbS — part of it through some seriously back-country roads across the Cumberland Plateau. The owner has dropped the asking price from $1,500,000 to a mere $999,999 (it’s been on Zillow for over 1000 days, after all). Earlier in the decade it was listed for as much as $5,9000,000. It has 30 bedrooms; 15 bathrooms; and sits on almost 250 acres. (14) NO FALL OF MOONDUST. Figuratively speaking, this genie is still in the bottle. Now, who gets to keep the bottle? Yahoo! News has the story — “Woman Says Neil Armstrong Gave Her A Vial Of Moon Dust, Sues NASA To Keep It”. A Tennessee woman is proactively suing NASA to keep what she says is a vial of moon dust gifted from astronaut Neil Armstrong. Cicco told The Washington Post she kept Armstrong’s autograph in her bedroom but didn’t see the dust until she was going through her parents’ possessions five years ago. NASA has not confiscated the vial, but Cicco says she doesn’t want the space agency to take it, so she filed a lawsuit on Wednesday to proactively assert her rights. It might seem strange to sue at this point, but proactive law maintains that in some cases, such as those involving trademarks, contracts, and potential disputes, it is easier, cheaper and faster to address problems before they happen instead of reacting to them. (15) BLOWN UP, SIR. Strange Angel premieres tomorrow, and I don’t remember linking to it before. Watch the official trailer for Strange Angel, premiering June 14th, exclusively on CBS All Access. Strange Angel, a drama series created by Mark Heyman (Black Swan, The Skeleton Twins) and based on George Pendle’s book of the same name, is inspired by the real life story of Jack Parsons and explores the dramatic intersection between genius and madness, science, and science fiction. (16) NOT EXACTLY AMAZING. After you read Galactic Journey’s review, you probably won’t jump into your time machine to look for a 1963 newsstand where you can buy this issue: “[June 13, 1963] THUD (the July 1963 Amazing)”. Jack Sharkey’s serialized novella The Programmed People, which concludes in this July 1963 Amazing, describes a tight arc from mediocre to appalling and lands with a thud…. (17) BRADBURY CALLING. This is from a column by Nilanjana Roy called “When Books Are Burned” in the Financial Times (behind a paywall). …What he (Bradbury) anticipated, even in the pre-Internet, pre-Twitter, pre-WhatsApp 1950s, was the time we’ve reached–an age of manic consumption of a constant stream of often useless information. For Bradbury, what was terrifying was not just the burning of books, it was the way in which people were prepared to turn against those who refused to sup at the same shallow pools, to persecute those who step away from the stream. Re-reading Fahrenheit 451 decades after I’d first read it as a teenager, I heard Bradbury’s plea far more clearly. In a world gone mad from too much junk, don’t forget reading, or books, or the necessaity of slow conversations and contemplative silence in a time of howling mobs and incessant noise. (18) GENRE INTEREST LIBERALLY CONSTRUED. Hey, is this an appropriate headline, or what? USA Today reports that a “Kickstarter aims to make Ruth Bader Ginsburg into action figure”. If you’ve ever wanted an action figure of Supreme Court Justice Ruth Bader Ginsburg, your chance is coming. FCTRY, a product incubator, kicked off a crowd fundraiser on Tuesday to raise the money to create an action figure of the 85-year-old associate justice. It gave itself 35 days to raise its $15,000 goal on Kickstarter. As of Tuesday evening, just hours after launch, the company had raised more than $67,000. (19) DUMBO TRAILER. Now out – the teaser trailer for Tim Burton’s all-new live-action Dumbo, coming to theatres March 2019. (20) VIDEO OF THE DAY. Fish With Legs is a Screen Australia cartoon on Vimeo, directed by Dave Carter, about what happened when all the fish in Australia suddenly sprouted legs!